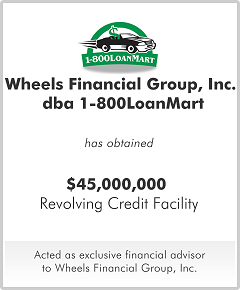 1-800LoanMart is a subprime lender which grew its annual originations at a 60% CAGR from 2002 to 2009. In early 2010, it was the leading title loan provider in California based on portfolio size; however, its growth was stalling due to lack of growth capital. Management engaged M&A Capital to assist the company in obtaining non-dilutive capital from a provider who understood subprime lending, including the recent federal and statutory regulatory issues. M&A Capital reached out to over 300 capital providers in a parallel process to determine all viable sources of growth capital for the company. The board of directors ultimately selected an alternate lender that provided a credit facility with improved flexibility, a 50% increase in maximum line, and the ability to provide expected future line increases. The $45 million credit facility provided management the liquidity necessary for the company to take advantage of significant growth opportunities in an expedited time frame.